TWA 800 on fire “may have looked like a missile attacking an aircraft”, proclaimed the CIA in a nationally televised video played during an FBI press conference. Still from from the CIA animation of TWA Flight 800, released on November 18th, 1997. But witnesses said a missile intercepted it. More than sixty said a distant, firework-like object rose off the surface first. Some said this object “struck” or “impacted” the jetliner, which was flying 2.6 miles up. 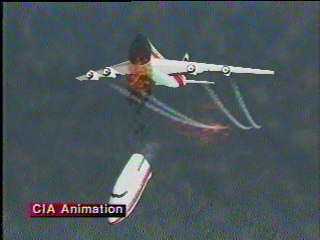 Nothing like the CIA video, which showed TWA 800 climbing alone without any intercept. Snippet from witness 73’s (name redacted) FBI Interview summary. After watching the video, I called some witnesses and asked what they thought. “Yeah right, [TWA 800] coming off the water”. Long Islander Paul Runyan said the first object rose up from the surface “like a rising flare”. Darrel Miron said the CIA video was a “total fabrication”. He said a light rose straight off the ocean and ended in a huge “star-burst”. After learning the event was nine miles away, Miron estimated the burst reached a mile in diameter. As a graphics artist, he offered to draft the sequence on his computer. His FBI interviewers wanted “no part of that”. The US news media never challenged the CIA video, subtitled “What Did The Eyewitnesses See?”. It was just like their failure to call out the CIA’s bad intelligence on Iraq’s weapons of mass destruction. Veteran news anchor Dan Rather admitted to being one of many “stenographers” during that dark period for US journalism. A few weeks after the CIA’s eyewitness video was the National Transportation Safety Board fact-finding hearing, where witnesses like Paul Runyan and Darrel Miron could have commented on the CIA video. But within days of the opening gavel, NTSB Chairman Jim Hall banned all witnesses and any discussion about them from that hearing. Dan Rather and the rest got to practice their stenography. With all significant news rooms at bay, the Safety Board’s Orwellian hearing was a success. Witness Group Chairman Norm Weimeyer, who determined that more than 90% of the relevant witnesses saw an object rise from the surface, was sidelined. He was ultimately replaced by someone who, according to then Acting CIA Director George Tenet, “worked closely” with the CIA for sixteen months. Dr. David Mayer distorted the eyewitness evidence to resemble the CIA video, which we’d later learn from internal CIA memos drafted before that video’s release, “couldn’t possible” (sic) be correct. Investigators found missile explosives and high-speed fractures in the wreckage. FAA radar tracking and debris field data matched eyewitness descriptions of a high-velocity event in midair. And in 2013, six whistle-blowers from the Safety Board’s investigation, then safely retired, detailed a cover-up. The documentary featuring these whistle-blowers and the above evidence, which in full disclosure I co-created, made the news. A few shows like NPR’s On Point with Tom Ashbrook, Megyn Kelly’s program, Democracy Now, and Sean Hannity’s radio show got it. But that wasn’t enough. News rooms at the New York Times and Washington Post remained conspicuously silent, though each paper of record told me privately they hadn’t the expertise to report on it, which I find hard to believe. CNN’s Jake Tapper let a PR representative who had no business managing the Safety Board misrepresent a whistle-blower and myself by name. The rep then told a convoluted story about how most witnesses heard a sound first and thus couldn’t have seen a missile. The truth is, hardly anyone who saw a rising object heard a sound first. The guy was just brazenly dishonest, and why not? With Tapper and the rest transcribing, he could have said anything. If you have a twitter account and feel motivated, re-tweet this request to Jake Tapper and others to #OwnUp.